Find hotel near La Vanille Reserve Des Ma .. The La Vanille Reserve Des Mascareignes or La Vanille nature Park sprawling over 3.5 hectares aims towards nature conservation, animal rehabilitation and Mauritian hospitality amid the lush green forestry laden with palm trees, bamboo groves and natural water bodies. The Insectarium boasts of featuring over 30000 preserved insects from 26000 species from five continents by the curator Jaques Siedlecki. The riot of colours of the butterflies and the insects will definitely mesmerize you. At the interactive farm and pony farm, the kids can feed the rabbits, goats, chickens, tortoises and ponies, take a pony ride and enjoy adventure sports at the playground. Iguanas, fish, waterfowl, turtle and crocodiles at the Aquarium and the Fossil Museum containing hundreds of fossils collected by Owen Griffiths from Madagascar are other attractions. 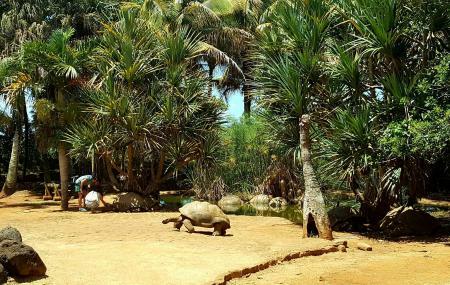 The best attraction of La Vanille Reserve Des Mascareignes is however, the Tortoise feeding session at 11 am and 1 pm. We had a fantastic day here in the beautiful setting. We made full advantage of the unique interactions on offer with the lemurs, crocodiles and tortoise. All the staff were genuinely friendly and helpful while doing a wonderful job looking after the animals and helping conservation .A must to visit. Great place to visit with kids. It's baby stroller friendly. At 11:30 you can watch them feeding crocodiles. There are many big turtles. You can feed the turtles. You have to buy the food for 25 MUR. I recommend visiting the Rochester Waterfalls and Gris-gris cliffs too. This parc is a real paradise, where you can feed the giant turtles and enjoy some super quality time in the nature. An absolute must when visiting Mauritius if you love animals. Very beautiful adventure park! You can see lots of animals and even interact with some of them. There are also guides available that show you around.